Modern city on the Adriatic Coast, crossed by the river that has the same name, Pescara is a little big city, the most important one in the Abruzzo for business and trade, border between the North and the South of Italy: with the close Silvi Marina and Francavilla, it gives life to a stretch of coast that is long more than 20 km. 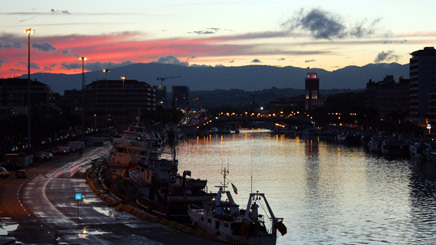 Year by year, Pescara has became one of the most apprecaited bathing cities by who wants a relaxing and funny holiday. Not only beach: in Pescara you can have a walk in the center of the city, rich in blloming gardens and squares with monuments. 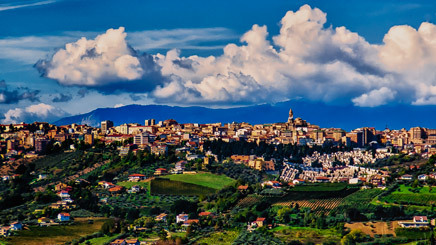 Birth city of the great poet Gabriele D’Annunzio, of Ennio Flaiano and the painter Cascella, during the good season a lot are the folk, musical, sporty and tourist events. To be visited: the Museum of the Sea, the Museum of the Abruzzese People and the D’Annunzio house. Emblem of the city of Chieti is the Cathedral of San Giustino (Saint Justin), the biggest and most important Church in the province of Chieti. Built in 700 PC upon the ruins of a pagan temple, was damaged in 801 by Pepin II the Short, was rebuilt in 840 in the same place upon Roman ruins, that were discovered during the last excavations. The big bell tower with mullioned windows, dated 1337 and is a masterpiece by Bartolomeo Di Giacomo. The interior of the Cathedral has a Latin cross shape; it has a Baroque style with three naves, divided by pillars, with dome and transept. The Civitella, Archaeological National Museum of the Abruzzo, exhibits the ruins by the Marruccini and is placed into the ex Frigeri building, in the Villa Comunale. Here you can see the well known “Guerriero di Capestrano”, the stele from Guardiagrele, the big seated Hercules coming from the temple in Alba Fucens, the dishes from Alfedena, the numismatics collection. In 1930 there were also found the Roman Temples, dated I century PC, whose basis testify the presence of a building from the IV-V century BC; the temples nowadays host a numismatic exposition. By Roman age are also the thermal baths, that include also a big tank divided into nine compartments with vaults ceiling. Flagship of the thermal baths is its floor, that represents a dolphin that surrounds a trident and two sea horses. At the end of the Marruccino Main Street there is the Villa Comunale, dated 1800, where it is placed the National Archaeological Museum of Abruzzo, while the garden is the main public park in Chieti. The Villa is one of the “Italian Wonders” by the National Forum of the Young. 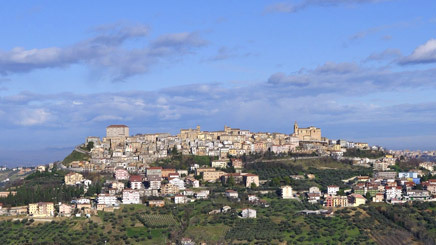 Bucchianico rises upon a hill next to the Majella, at about 10 km from the coast. This area is rich in typical formations known as the “calanchi”, that develop for about 3.5 km and are about 100 meters high. Once in Bucchianico, we suggest to visit the Sanctuary and the monastery of San Camillo de Lellis and his house, today a Museum; the Church of Sant’Urbano, where are preserved the relics of the Saint and of San Aldemario Abate and the Baroque Church of the Purgatory, dated about ‘700.